Today brings us the penultimate episode of The Dante Experience! What a long, crazy ride through Hell it has been. Dana Dyer Pierson, along with her husband Joel Pierson, created the award-winning Mind’s Ear Audio Productions. They created such nationally honored productions as French Quarter, Children’s Zoo and The Dante Experience. 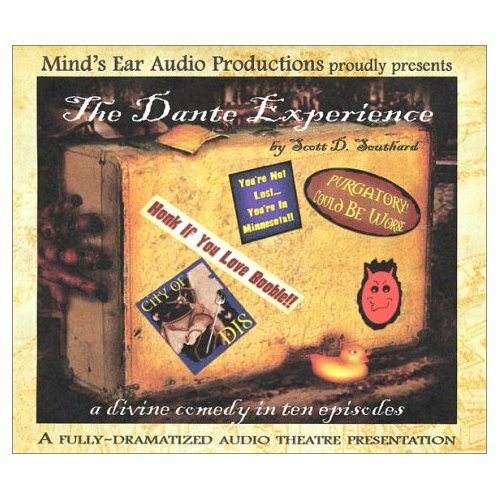 Besides producing Dante, Dana also created the sound design; a series that included everything from a musical number in Hell, to a boxing match, to a TV talk show! Every time I listen to the series I am just floored by her work on the series. What inspired you to work in radio? I chalk it all up to lazy babysitting, honestly. When I was little and my older brothers tired of me, they would plop me into a wingchair, put some headphones on my tiny head, and drop the needle on one of their sound effects records. I was entranced by these random noises—and would unconsciously start creating stories to make sense of them. Thus, by accident, a sound designer and playwright was born. I got my start in radio as so many did: I volunteered at a community radio station. So I owe it all to the fine folks at KBUT in Crested Butte, Colorado, who taught a brash young voice how to work the control panel and craft an engaging show. I did everything, it seems – I started out with a drive time show I called (in the fashion of ridiculous twenty-somethings everywhere) the “Rhex Montoya Eclectic Radio Hour” or something. I stupidly interpreted ‘eclectic’ to mean that I could spin whatever the hell I wanted, for any or no reason, so when I first started, I exploited that shamelessly. I would play The Police, followed by New Orleans jazz, followed by Bah, followed by a show tune, followed by some comedy bit—and think I was so painfully avant-garde. It was a bit, shall we say, indulgent? Eventually, I grew bored with the mayhem, the sheer randomness of it, and then decided to mature the concept a bit by exploring rotating themes, week to week – pop one week, jazz the next, show tunes the next—that sort of thing. I also did a classical show on Sundays and was the go-to fill-in DJ when others couldn’t cover their shifts. And of course, I produced the station’s audio theatre programs. KBUT wanted to start producing original audio theater, so they figured I was a logical choice to head the effort. I was also a part of the company of the Crested Butte Mountain Theatre, and together with KBUT, they teamed up to send me to my very first Midwest Radio Theater Workshop in Missouri. That was a great year—not only did I learn enough to get our troupe off the ground and on the air, I also met the lovely man who would become my husband, one Joel Pierson. It was a great week. Do you have any favorite work you have done in radio? Tell us about some of your other work you are proud of. 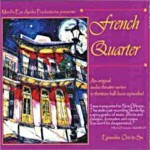 French Quarter will always be one of my proudest achievements, on any stage. It was truly ours: We came up with the concept, created those amazing characters who became friends, wrote the scripts, engineered it, designed it, and knew the joy of a worldwide audience as part of the prestigious NPR Playhouse season – twice. It also won a handful of national awards and is used as a teaching tool for sound design and writing, so yeah, I’m fiercely proud of my part in its creation. It was a joyous collaborative effort that consumed a little more than a year of our lives. It sprang to life on the drive home from our first trip to New Orleans, a town that is unique in so many ways. It sounds like no other place, I feel, so it was a logical choice to set a story told with sound. On the long drive home, we started sketching out concepts—and by the time we reached Chicago, it had evolved from a one-off play to a full thirteen-episode series. What are some of your memories around working on The Dante Experience? How much sheer fun it was to bring to life. How clever and strange that script was! How weird and talented our cast was. How utterly discombobulated one of our actresses was whenever she had to say “Mephist. And of course, playing Mephistopheles’ Mom was a honor and joy. “Mephistopheles Fritz Young! You’re not going to cook her at all? You’re expecting us to eat her … raw? I am not hearing this! What kind of devil are you? I really don’t know you anymore!” Brilliant! It was a really challenging series to create, because so much of it happens in a place that doesn’t exist. But if you think about, every one of our “places” in audio exists beyond reality, so… Trying to find the right balance between comedy and technology is always a challenge. You don’t want to club a witty script to death with generic wacky sound effects; at least, I don’t. You created some fascinating sound spaces around Dante. Can you describe the process? Which was the most challenging or fun? And as the engineer and sound designer, I obsessed over, “How the hell does Hell sound?” Creating the soundscape for the River Styx was a blast – those little fireballs took me forever to cobble together, but WOW, was it fun! It has so many elements, that little effect. I put hours into that one little sound, but I think it was worth it in the end. It was a combo of prerecorded SFX and foley work that I manipulated—gum popping, cellophane wrinkling, a small explosion that was squashed to scale digitally, a finger pop, wind, a chimp’s warning grunt (to add depth), a little glass breaking, that sort of thing. For such a tiny sound, it was a huge process, but I couldn’t let it go. It was my white whale. It HAD to be right. Finding the exact blend of filters to throw on our demon voices was fun –hours of experimentation. A little flange, a little pitch shift, a little echo, and when Mephisto was really angry, I’d layer in a very subtle track of the same speech, but reversed, and I also added a really distorted cry of raw rage in there. It’s the kind of detail you can’t really hear intelligibly, but there’s this disturbing otherness to it that I’m proud of. Just another layer of texture and character. The trick with this sort of digital manipulation is also knowing when to stop – I think we pushed it JUST far enough without sacrificing clarity. I think that a good sound designer sees sound effects CDs in the same way a good painter sees paint or a chef sees ingredients. They are nothing more than the raw elements you start with, not the final product, and how you make each one your own is the key. Any idiot can slap blue paint on a canvas. Any idiot can fry an egg. Any idiot can plug in the sound of a door closing. The artistry comes in using these ingredients creatively, in ways someone else may not. And by layering and mixing and customizing these generic sounds, you can create a reality that is uniquely your own. The best sound designers, in my opinion, are deranged and wonderful and a bit crazy. We don’t follow the rules. We don’t stop at the basics. We don’t limit ourselves to the expected. We’re not afraid to use something utterly out of the blue to make the magic. And if we have to attack innocent fruit with medieval weaponry in our back yard to get the sound (or one tiny element of a new sound like a fireball in hell), by crikey, that’s what we’ll do. My process is a bit chaotic, organic. I know what I want it to sound like (much of the time) but am not always sure how to make that happen. So, it’s a blast back to childhood some days. But now, I’ll put a sound effect CD in and just let it play – see what catches, and then figure out how I can digitally manipulate the sound of a hydraulic brake and a waterfall in reverse into a demon’s hiss. I love how everyday sounds become extraordinary when they are layered with other sounds. Crafting the background soundscapes of hell was a blast, literally. As memory serves, I used the expected wind sounds, but added in howls and bird sounds (slowed way down and reversed) and clanging metal and gorilla calls and bubbling soup and earthquakes and tornados and nuclear explosions and tanks and aircraft engines and escalators and … it was fun. The sounds of Booble the tiger were actually panther cries, as memory serves, that I tweaked to give it a bit of an otherworldly element. And we did a lot of experimental stuff – cramming the poor cast into our car in the Indiana summer heat and jamming a few microphones in there as they revved the engine, that kind of thing. Do you miss working in radio? Yes and no. It’s heartbreaking for an artist to pour everything into a work of creation and then see it founder, unloved. At the height of our audio theater production days, the demand for this sort of work was weakening. So I don’t think our work really enjoyed the full attention I feel it deserved—but, for what it’s worth, the people who DID hear it LOVED it. I guess we were spoiled with the reception that French Quarter enjoyed. Our contacts at NPR Playhouse estimated that it was heard by nearly fifty million people. That’s not too shabby. It pains me that Dante didn’t get a MUCH bigger audience because it’s without question, some of our best work, but … there’s always a new audience lurking around a digital corner, yeah? We should get our entire catalog up on iTunes, don’t you think? What are your hopes around radio? Where do you see the art form going? I hope that people realize that there is much more to radio theater than just the old “Old Tyme Radio” (OTR) stuff, because I think that perception is what holds it all back. Modern audiences are too sophisticated to want the hokey “the gun in my right hand is loaded” <BANG, sound of body falling> OTR schtick anymore. With the explosion of audiobooks, you’d think that audio theater would be the next step in the evolution of audience demand, but… With the astonishing, nearly limitless production capabilities that digital editing affords, you ‘d think it would be everywhere, but… I mean, my first shows were spliced together on analog TAPE – with razor blades and scotch tape. Now, I can manipulate sounds to the 1000th of a second, with unlimited tracks, and with more digital bells and whistles than I know what to do with. 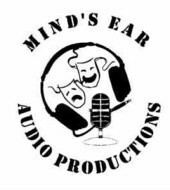 But now, Mind’s Ear is purely a professional production house, creating narration and voiceover tracks for our commercial clients. I love this new era, don’t get me wrong. It’s a honor to be a part of these projects. We also produced the audio for the official tour of Arlington National Cemetery a few years ago, and since then, our voice talents are the voices of the National Highway Department, the General Accounting Office, the National Nuclear Safety Administration, the California Border Patrol, the Army Medical Corps, the US Census Bureau, and many more branches of the federal government. And I can now tell you more than you might care to know about penetrating eye injuries or how to install a guardrail. So that’s something. This entry was posted in Fiction and tagged Afterlife, Angels, Arlington, Children Zoo, Comedy, Dana Dyer Pierson, Dante, Devils, French Quarter, God, Heaven, Hell, Humor, Joel Pierson, Mind's Ear Audio Productions, Radio, Radio producing, Silly, Sound Design, The Dante Experience by Scott D. Southard. Bookmark the permalink. This week I learned the sad news that the producer of The Dante Experience, Dana Dyer Pierson, has passed away unexpectedly. It’s not often you get to have one of your writing dreams come true… and you know who exactly to thank for it. Along with her husband Joel, Dana took my scripts and made them come alive. For that I will always be eternally grateful. I first met Dana and Joel at the Midwest Radio Theater Workshop. They were so much fun and so much in love. They were the heart of that week and where they were, you wanted to be as well. Meeting them was the best thing about that time and I cherished every moment I had of laughing with them and goofing off. In a bygone age when radio drama was still king they both would’ve been huge and this news would’ve been like a rocket through the media, from Twitter to, of course, NPR. Dana and Joel were always friends I wanted some day to catch up with again, maybe even convince them to work on something again with me. Besides the radio series, I also had the pleasure of having them produce live radio shows around some of my short stories. It was all such a joy for me. Dana, this writer is going to miss you and the dreams of those possibilities. A few years ago when I got permission to share the radio series here on this website I interviewed Dana. I am reblogging the interview today. You can also listen to the entire series and Dana’s amazing work on the main page for it. Dana, if you see Dante squeeze his ducky for me.